When you choose Brightcove Video Cloud as your online video platform, you’re not only gaining access to some of the premiere tools to manage and deliver video content to any desktop, mobile or connected device, you’re availing yourself and your organization to a vast ecosystem of Brightcove Alliance technology and solution partners that can help you build upon and expand the capabilities of Video Cloud. Advertising is a critical and flourishing part of the Video Cloud partner ecosystem and a powerful value-driver for our media customers. Brightcove’s online video advertising partners form an alliance of more than 35 leading technology companies focused on providing solutions for all different flavors of advertising, from in-stream video ad insertion, overlays and companion ads to ad management, serving and networks. The breadth of solutions available from Brightcove’s alliance partners, coupled with native Video Cloud platform capabilities and tight technology integrations, form a veritable advertising tool kit with which Video Cloud users can build tailored ad programs that closely align with their particular content, audiences and markets. Brightcove’s integration with Google’s DoubleClick for Publishers (DFP) Video, for example, allows users to manage their entire display advertising through one platform. This offers the ability to package, forecast, sell and report on any set of videos, and create differentiated video ad selling opportunities. Back in October, Brightcove announced the integration of Video Cloud Express with DoubleClick DFP Small Business, opening a host of new revenue-generating opportunities for Video Cloud Express Plan II and III users. To help those users get their advertising programs started, DFP Small Business is available for free up to a limited number of ad impressions. Similar opportunities for small and medium businesses are available to Video Cloud Express users through Brightcove’s integration with publisher-side ad server OpenX. Working with Tremor Video, Brightcove offers publishers a variety of advertising solutions covering content management to inventory monetization. Tremor Video’s Acudeo dynamic ad delivery tool works seamlessly with Video Cloud, making it easy to offer pre-roll, mid-roll, post-roll or overlay advertising. The Brightcove-Tremor Video integration can be seen in action on numerous websites, including Men’s Fitness. Thanks to an integration with YuMe, Video Cloud users can take advantage of access to YuMe’s extensive advertising network and its Ace Ad Management platform. The combination gives publishers the flexibility to serve their own advertisements or receive those sold by YuMe. Brightcove sees a tremendous amount of value in these types of collaborations, as they connect video publishers of all types and sizes to a wealth of possibilities in online advertising. Suddenly even the smallest operation with the right content and audience can start realizing revenue by serving up ads from some of the world’s leading brands. From a user experience perspective, Video Cloud’s open APIs are opening the floodgates for customers to build a broad range of native capabilities into their players. Advertising is a key element in this space, spurring numerous innovations such as the one developed by New Zealand television and digital media company TVNZ with its TVNZ ONDEMAND player. 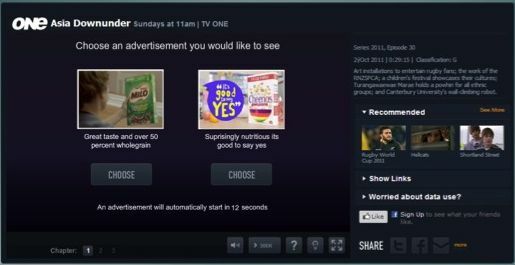 At specified commercial breaks, TVNZ online viewers are presented with options in their player that allow them to choose which ad they would like to watch, automatically increasing the level of engagement. TVNZ is also taking advantage of the Brightcove-DoubleClick relationship for its online advertising program. TVNZ's ONDEMAND player lets viewers choose which ad they want to watch. These examples merely scratch the surface of the capabilities that are afforded through Brightcove’s advertising technology partners, which also counts among its members such well-known and proven organizations as 24/7 Real Media, adap.tv, Adotube, ADTECH, FreeWheel, LiveRail, and Smartclip, among many others who cover the wide scope of online advertising. Of course, before diving headfirst into online video advertising, developing a strategy is a wise first step. An excellent rule of thumb is to look at advertising as monetizing your audience rather than simply monetizing your video. This includes incorporating advertising throughout a site, within and outside the video window. Ad sales opportunities include video ads, banner ads, text ads, sponsorships, placement in content, and branded content. Additional white papers and other valuable resources such as on-demand webinars, product videos and case studies are always at your disposal in the Brightcove Learning Center.